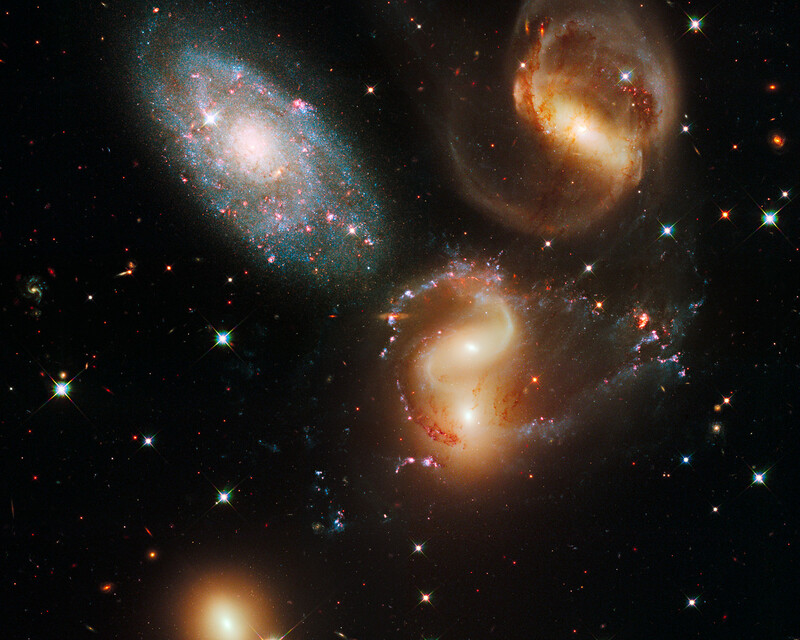 This portrait of Stephan's Quintet, also known as the Hickson Compact Group 92, was taken by the new Wide Field Camera 3 (WFC3) aboard the NASA/ESA Hubble Space Telescope. 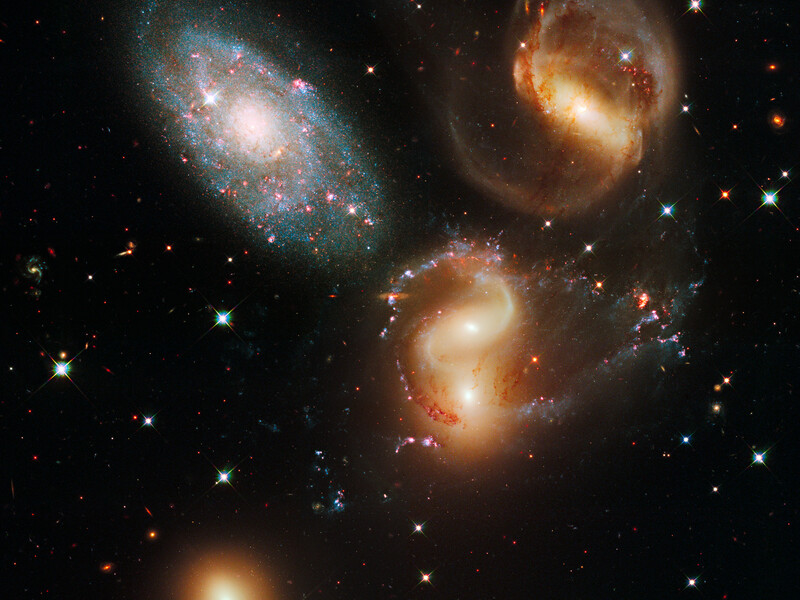 Stephan's Quintet, as the name implies, is a group of five galaxies. The name, however, is a bit of a misnomer. Studies have shown that group member NGC 7320, at upper left, is actually a foreground galaxy that is about seven times closer to Earth than the rest of the group. The image, taken in visible and near-infrared light, showcases WFC3's broad wavelength range. The colours trace the ages of the stellar populations, showing that star birth occurred at different epochs, stretching over hundreds of millions of years. The camera's infrared vision also peers through curtains of dust to see groupings of stars that cannot be seen in visible light. Sharply contrasting with these galaxies is the dwarf galaxy NGC 7320 at upper left. Bursts of star formation are occurring in the galaxy's disc, as seen by the blue and pink dots. 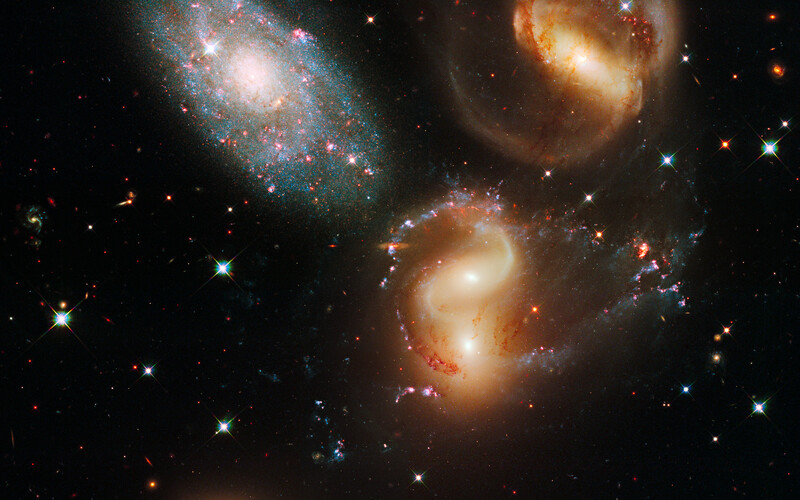 In this galaxy, Hubble can resolve individual stars, evidence that NGC 7320 is closer to Earth. NGC 7320 is 40 million light-years from Earth. The other members of the Quintet reside about 300 million light-years away in the constellation Pegasus. These more distant members are markedly redder than the foreground galaxy, suggesting that older stars reside in their cores. The stars' light also may be further reddened by dust stirred up in the encounters. 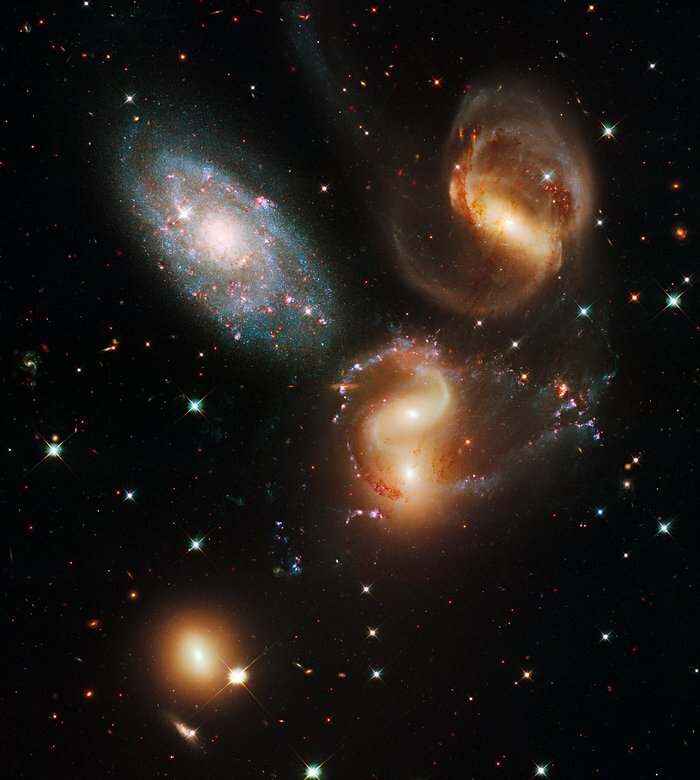 WFC3 observed the Quintet in July and August 2009. The composite image was made by using filters that isolate light from the blue, green and infrared portions of the spectrum, as well as emission from ionised hydrogen. Position (Dec): 33° 57' 36.41"